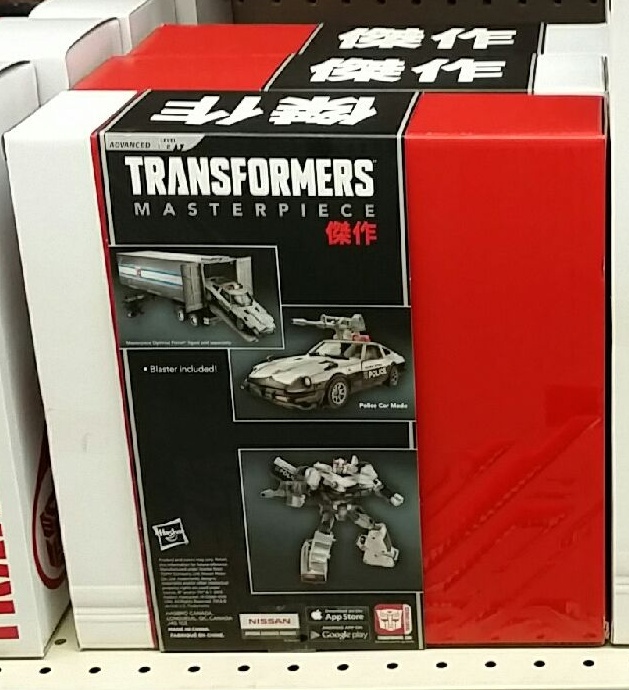 Hasbro finally released another Transformers Masterpiece. This time the G1 Bumblebee. The Transformers Masterpiece Bumblebee Figure does an amazing job or capturing the robot from the cartoon. This line always does a nice job and that’s why I have been waiting for a Mirage figure for so long(I bet that figure is hung up in licensing issues) I found this bad boy at Toys R Us. 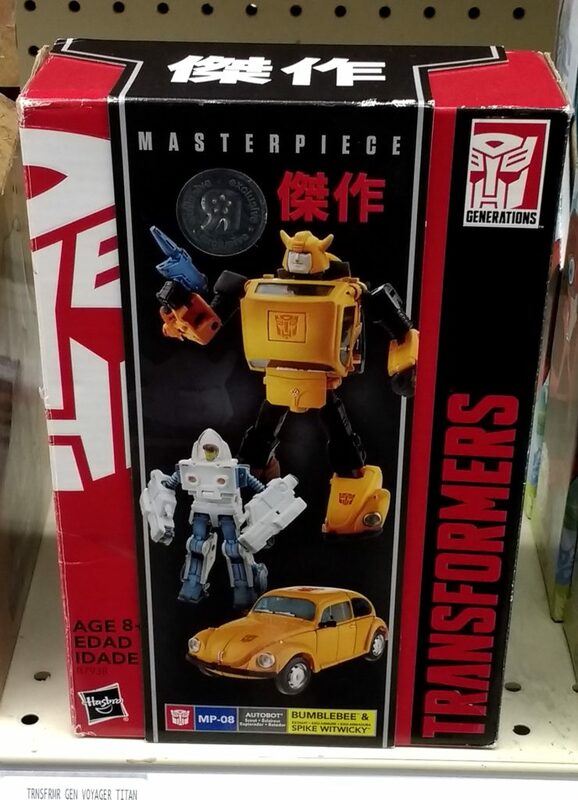 Its nice they let them use the VW Bug for Bumblebee. I will probably pick up this one pretty soon. 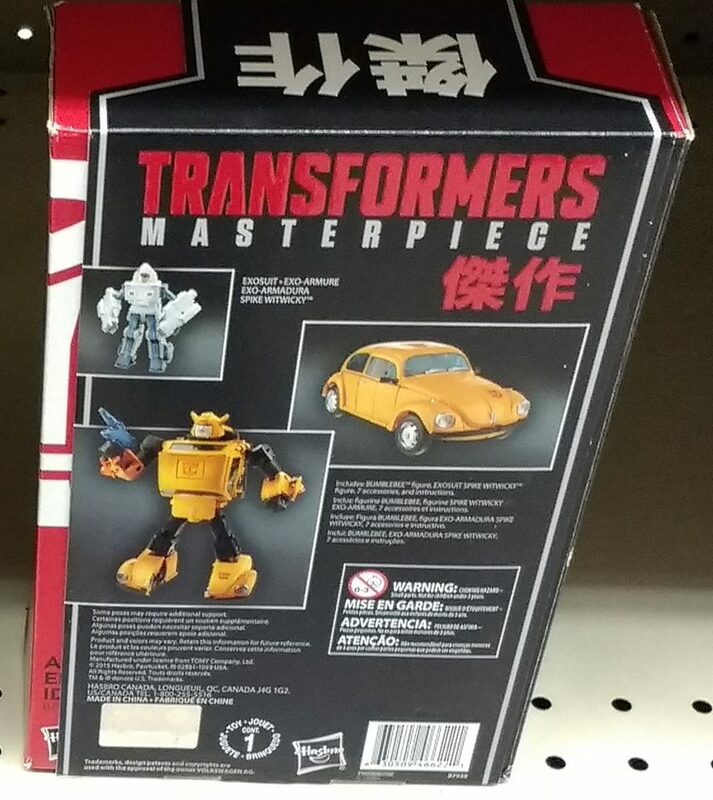 I have seen the Takara version on eBay for a bit, but I am always worried about picking up a shoddy Chinese bootleg. So the best way to make sure I get the real thing is to get it from Toys R Us. Comparing this to the original release is just sad. The original G1 Bumblebee came in red and yellow, I actually really disliked that set of original mini vehicles. They looked cheap and poorly made. The design was crap. That’s why I never purchased any of them in the 80’s. As a character, I just hated Bumblebee too. He was so irritating. But now I guess he is just part of my nostalgia. If I get any Bumblebee figure its this one. I took the pictures a month or two ago, but have been too lazy or busy to post it. But here it is! 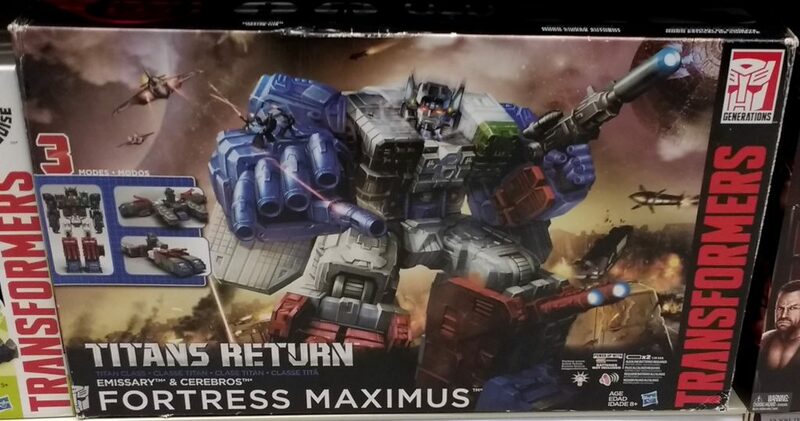 On the same visit also saw the Fortress Maximus from the Generations series which is just a huge 22″ figure, but it should be for $150. Since I am not planning to put up a post on it or buy it, here is a quick pic. Its actually a pretty cool robot. I would be pick it up if I had the space. 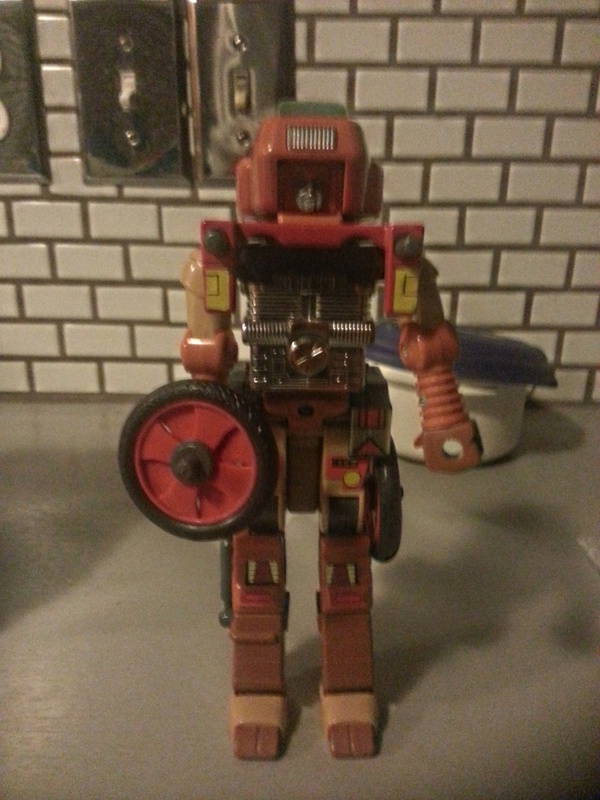 Here’s another one I never had as a kid, Wreckgar – leader of the Junkbots of Junkion. He was first seen in Transformers The Movie and turns into a motorcycle. Seems like it was much more important for it to look like a motorcycle when it transformed than to look like the robot in the movie. The toy came out in 1986. By this time I wasn’t collecting Transformers. I did not really care for this character in the movie. But I picked it up a couple of years ago so I could complete the set of Generation 1 Transformers I actually wanted. Wreckgar came out in 2010 Reveal the Shield which is far superior to the G1 release. And Target has a Exclusive version out right now Transformers Generations Platinum Edition Planet of Junk Clash that includes Hot Rod, Wreck-Gar, and Junkion Scrapheap figures which is pretty nice if you have $75 to shell out. 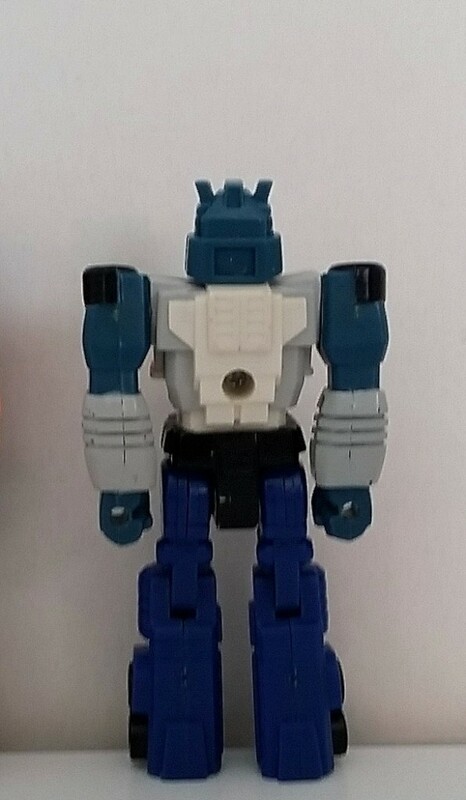 The Generation 1 Jazz Action Masters figure by Hasbro in 1990 is another attempt to make a figure that is more true to the cartoon. It does a pretty good job. It’s not amazing, but it is a nice try. I think the size at 3.75 inches limits how accurate the figure is to the source material and the manufacturers were forced to limit the proportions/size based on packaging constraints. If the figure were made half an inch to an inch larger, they could probably have added much more detail and gotten the proportions right. So all the figures from the Transformers Action Masters line are almost exactly the same size and proportions. Shockwave is my favorite robot from this line. The Jazz figure is just another solid addition. 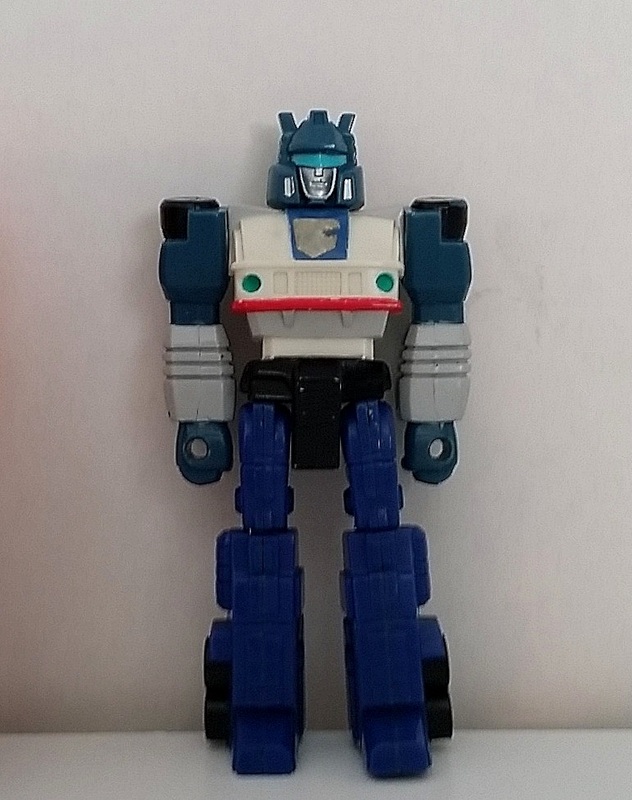 Like the previous post for Wheeljack, Jazz lacks the correct proportions if you really want to capture the cartoon, but this appears to be the style of line. 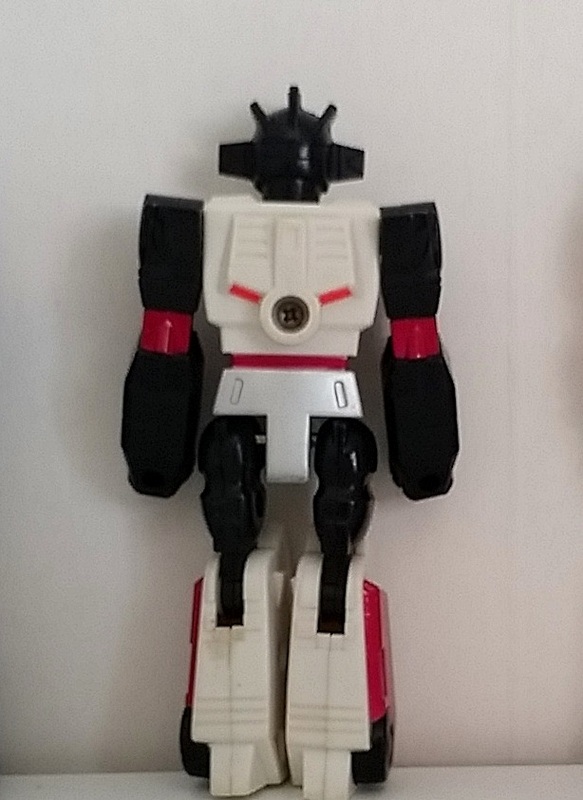 Here is the Wheeljack Action Masters in 1990 from Hasbro. The Action Masters line did for the first time, what no other line had done so far. 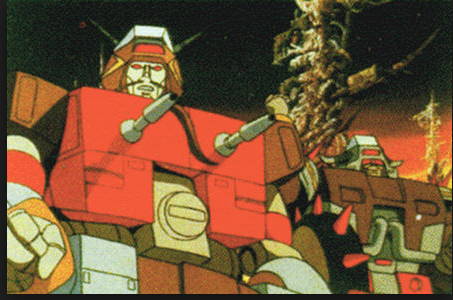 Not only did they not transform, but they also reintroduced several of the core Generation 1 robots. It was nice to see these robots again in another form. I am a big fan of Wheeljack, but not for this figure. I really wanted to like this one, but for reason it just does not look or feel right to me. The proportions seem really off when you compare him to the cartoon. He should have a wider chest and have more bulk all the way around. He looks too skinny for me. While the Action Masters line is meant to reflect how the robots look in the cartoon, they really missed on this one. 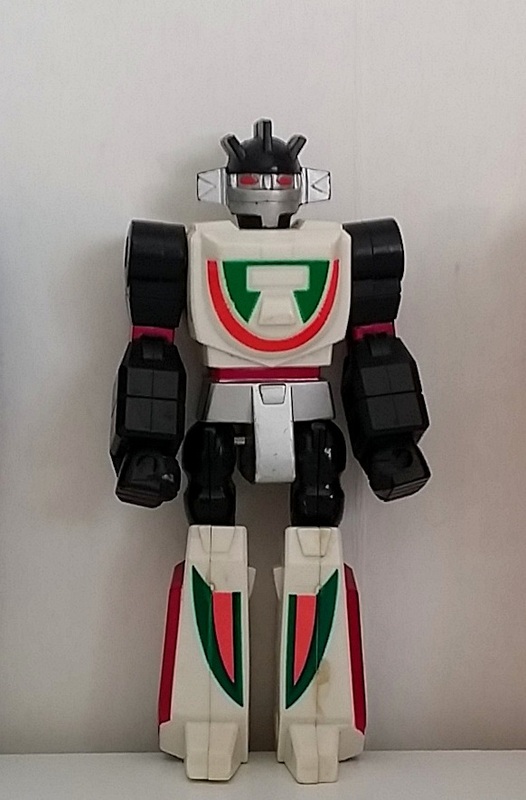 The newer figures from the Classics line do a better job of depicting Wheeljack than this one. This is still a solid representation and seems to be the style of this particular line, but this is just ok for me when I really wanted it to be amazing. The Shockwave Action Masters is a robot in the line of Transformers that does not transform(weird right?) and is meant to look like the robot in the Generation 1 cartoon. The nice thing about these robots is they really do look as close as any toys to their source material. Many of the Generation 1 robots look nothing like the cartoon. The Megatron figure comes to mind. The Hero Mashers Transformers line in 2014 reminds me of the Actions Masters, except the Mashers are larger and more posable. Shockwave is about 4 inches and looks like he just jumped out of the cartoon. Some of the colors are off, but it really does not hurt this figure. This Shockwave is a bit beat up, so no poses as it can barely stand. It is leaning on the back of the cabinet. I need a nice minty new one so I can see if they can pose and stand without issues. I picked up Shockwave at a local comic book store. They had a bunch of loose Transformers and I had never seen the Action Masters before. They looked super cool and I really liked the idea. I am surprised it took them 5 years to get around to it. So I have not been putting out any posts. But I found some of these only at Target Exclusives pretty cool. The Transformers Perceptor and Blaster. They look like exact reissues of the Generation 1 robots. Plus Perceptor come with three tapes Steeljaw, Ramhorn and Eject. All 3 tape robots transform and the tapes have always been fun to transform. I have not seen any of the exclusives at the store, only on the site here. It is a pretty sweet set if I had $99.99. It also comes with 6 slides and a slide case you can view when Perceptor is in microscope mode. 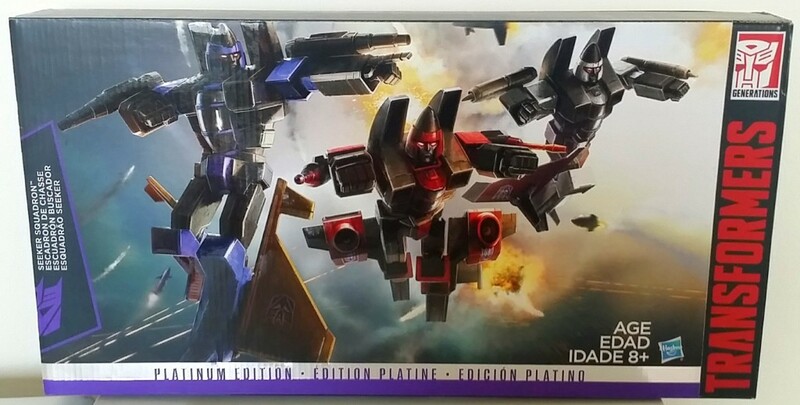 The Transformers Platinum Edition Seeker Squadron 3-Pack is the one I want to pick up. It comes with all 3 conehead seekers Thrust, Dirge, and Ramjet. It is a sweet set of Generation reissues. I have a special place in my heart for jets that turn into robots. I can’t wait to get mine. The last exclusive is a nice looking Optimus possibly one of the movie versions Transformers Platinum Silver Knight Collector Exclusive. You can see him here. 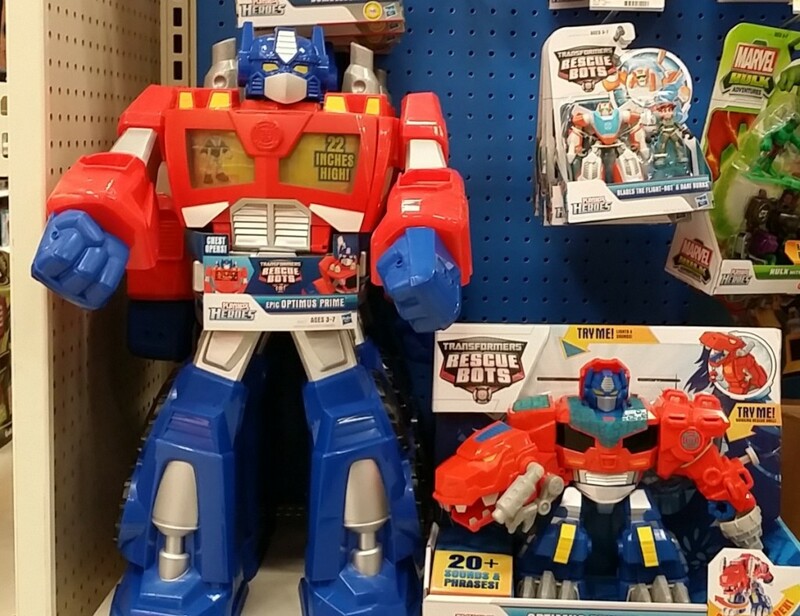 I don’t really care much for the Rescue Bots line, but the big robots have a special place in my heart. This 22 inch robot reminds me of the vinyl 2 foot Jumbo Machinder/Shogun Warrior robots of the 70’s(I wish this thing had shooting fists so bad!). Those are some of my favorite robots. That and this is probably the biggest Optimus Prime ever. What Transformers fan wouldn’t want one of those? Well Toy R’ Us has them for $12.98 on their site now just in case you want one. I bet they still have them at the store. Next to the Epic Optimus Prime is the Optimus Primal from the Rescue Bots line. The 22 inch Optimus is much more impressive in comparison and as I write this I am more and more tempted to buy one. As I have limited space, I am trying to resist as best I can. Playskool Heroes also has a Star Wars line that is really cool. Their Millenium Falcon and X-Wing ships are pretty nice. 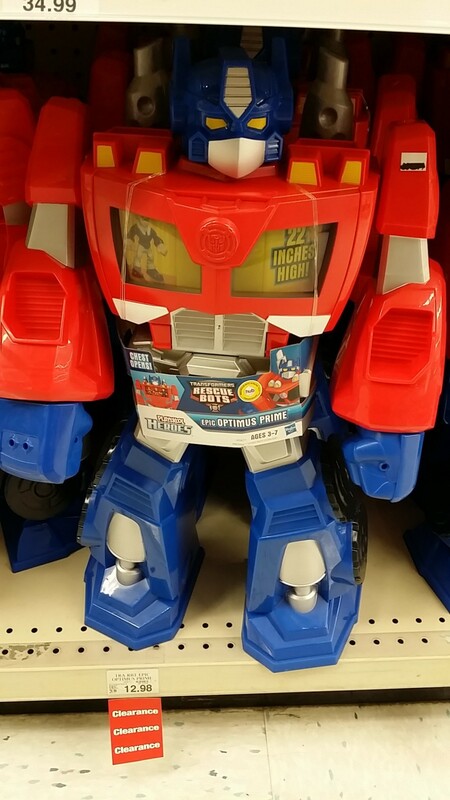 Here is the Epic Optimus Prime on the Toys R Us clearance aisle two weeks ago surrounded by his brothers. It reminds me of the scene in Toy Story with stacks of Buzz Lightyears. I think my only problem with the Epic Optimus robot is that his arms and legs are hollow in the back. It makes it feel like a façade rather than a fully fleshed out robot. The chest is a compartment so that part and the head are the only parts that are not hollowed out in the back. But for $12.98 it is not a terrible buy and it is likely the best piece you will ever see from the Rescue Bots Transformers line. 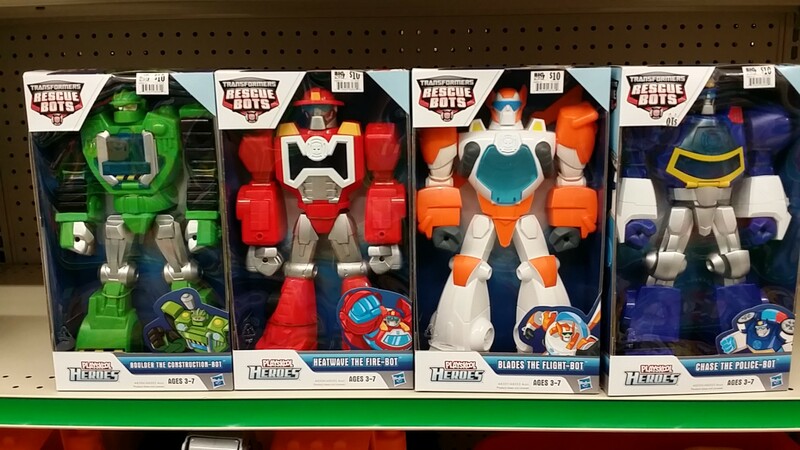 I found these robots from the Transformers: Rescue Bots series at Big Lots. I had seen them before at Toys R’ Us and Target. I never realized this was a cartoon. I had seen the toys before, but I am surprised this was an actual branch of the animated series. 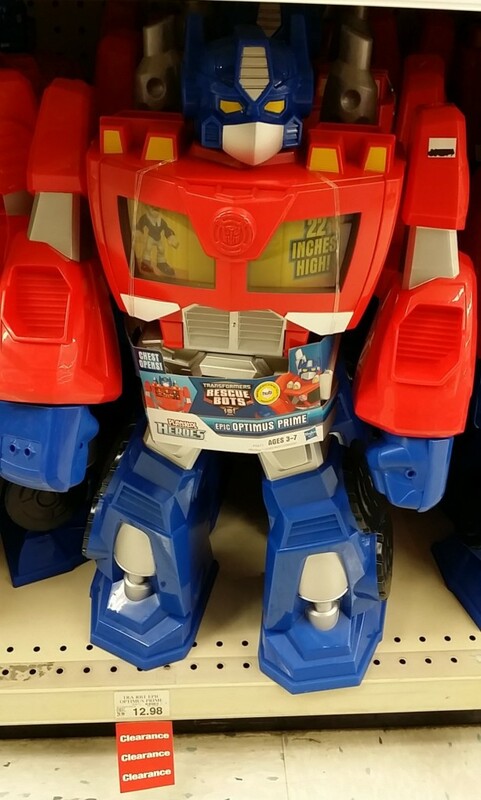 Toys R’ Us was blowing out the huge two foot Optimus Prime robots from this series for $12 in January. That is the largest Optimus Prime I have ever seen. This is another option for kids to enter the Transformers franchise, but I much prefer the Hero Mashers line to this one. The cartoon started in 2012 and I think it is still going. The Playskool Heroes brand is aimed at young children, so you won’t likely see any other posts on robots from this line unless they look really cool. The Bots Boulder the Construction-Bot, Heatwave the Fire-Bot, Blades the Flight-Bot, Chase the Police-Bot kind of look like a knock off line robots with better except with better quality and design than most knockoffs. Although I do not care much for this line of robots, it is fun to see different robot lines and interpretations of the Transformers. I would love to see some of the Generation 1 robots in this format. Especially the bad Seekers. Too bad they only made these robots with which I have familiarity. Oh well, this is money I will not spending these robots. Prowl is a nice piece to add your Masterpiece collection(probably the best one this year). I have yet to own one of the Masterpiece Editions, but this one is making me think about it. I usually try to add the cheaper new Transformers or pieces from the 70’s, 80’s and early 90’s. Prowl is one of my favorite Autobots and one of the better Generation 1 toys. I never had one and this piece is so much nicer than the original G1 robot by far, but for the price I wish it was a little taller than 7 inches. It looks so close to the cartoon version it is making me itch to see the old cartoons again. From the pose on the box it has much more articulation than the original, so poses will be much more fun than what you could do before. The police car transformation really looks great, but the robot form is where the toy really shines. What a beautiful version of Prowl. Though it seems a lot of people prefer the Takara version. The only big plus I can see is that the missile launchers shoot( I actually prefer the white missile launchers to the original black ones. They look too big). 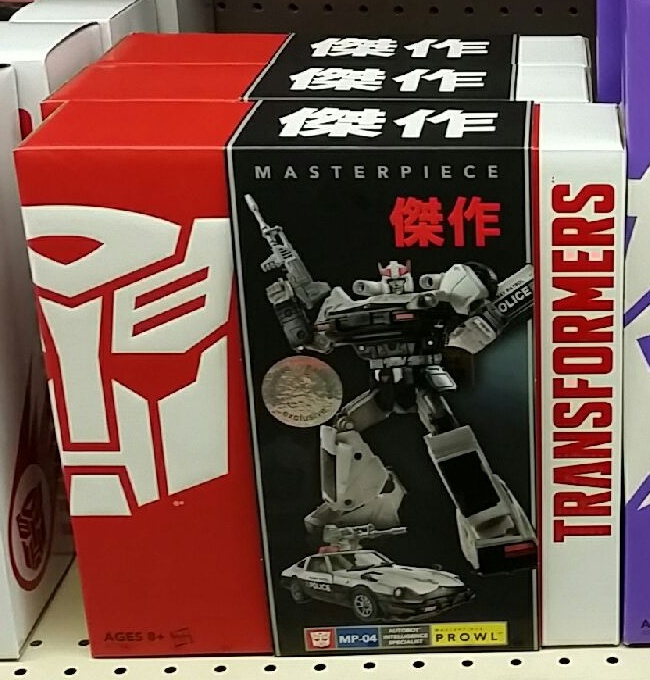 One other plus I see is the Takara box is so much smaller. The Hasbro box seems like a space waster. You can get either version on Amazon, eBay or ToysRUs.com. If you are going to pick up a Masterpiece robot Prowl blows away Sunstorm. And the Masterpiece Grimlock re-release is just another reissue. So they will likely put him back out again in some form or other. On a recent trek to Toys R’ Us I found a stack of Masterpiece Sunstorms. It was a pleasant surprise and they were fun to look at. I am afraid that the bright yellow color is so ugly, that I will never seriously consider adding this piece to my collection. Maybe if they blow Sunstorm out here on clearance for $30, but I will not be paying $79.99 to add this Toys R’ Us exclusive due to limited funds and space. I do not have a Masterpiece Seeker in my collection and would love to add one of the other ones like Skywarp, Thundercracker, or Starscream, but Sunstorm is very low on my list. I wish they had chosen another robot for the Masterpiece edition. Say Shockwave or Arcee. Instead they do a redeco of Takara’s Masterpiece MP-11 Starscream mold, which kinda tells me they are too lazy to make a new mold. They are really milking this one. The sculpt is the same one they used on the Acid Storm and Thundercracker which were also Toys R Us exclusives as well. It is an amazing sculpt and I do not blame them for re-using it, but it would be nice to get some new original product. Maybe if they used the orange/goldish color in the first cartoon I would actually be interested in this robot.